Learn Chinese efficiently in four steps with Hanzi Explorer a very powerful and intelligent tool. This tool features an impressive animated writing where every Hanzi is derived in boosting memory skills by coloring components which are animated in big size stroke by stroke. An added feature of this tool is that all complex words and National standardized Chinese characters are spoken by a famous Chinese National Broadcast Announcer. This tool has and inbuilt variety of Chinese characters and school books and on the other hand it even helps you to easily build a personal learning list from any available articles or E-books of your choice. This tool works on Chinese Windows platform from Windows 95 to XP and also works on windows 2K and XP in your language. It gets compatible without major changes; in just a few simple clicks your PC will be supporting Chinese. An ideal Chinese learning package Hanzi Explorer is suitable for experts and beginners who are aspiring to learn the language. 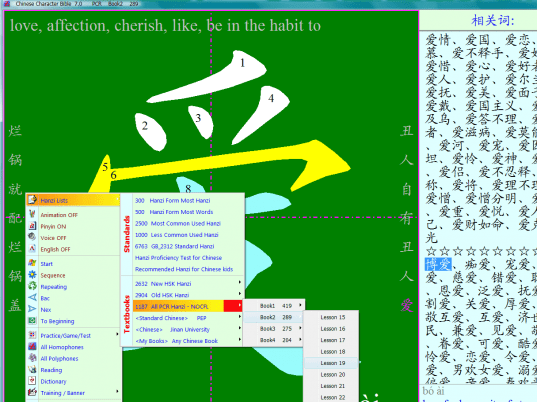 Hanzi Explorer features a unique writing animation, every Hanzi is derived from its etymology or memory skills to color components and animated in big size stroke by stroke. These effects will dramatically enhance your memory efficiency. The voice of a FAMOUS CHINESE NATIONAL BROADCAST ANNOUNCER guarantees that you'll learn the correct pronunciation. Hanzi Explorer contains a variety of Chinese National Standard Character sets and school books. Hanzi Explorer is for the young and the young at heart, for beginners and experts, because everyone will find suitable access either to start or to continue. And even better! With this tool you can also load, process, study any other Chinese learning stuff without limit. Many intelligent games and a powerful reading panel are ideal for practice. Besides, a smart and powerful Chinese-Chinese-English Dictionary is also inclusive. Making your own color flashcards by means of Hanzi Explorer will allow of studying Hanzi anytime, anywhere. If you study Chinese, you need to study Hanzi! If you use Hanzi Explorer, you'll learn Chinese rapidly. Large collection of characters. Good display of composition. Fullversion bound to local computer.